It’s no secret that I’m more about letting yarn do what it’s supposed to do. What do I mean? Mohair added to any fiber, man-made or natural creates a beautiful subtle halo of color and softness, but combining novelty yarns together “knit as one” or with a natural fiber does not interest me. Yarns have their own fiber content, color and texture waiting to be transformed. Knit as individuals, different gauges and fiber content used in the same project creates a juxtaposition of weight and appearance which produces an interesting sculptural quality. In my personal opinion, combining yarns “knit as one” does not allow the individual yarn to speak for itself. Knit and crochet stitches translate for the yarn a language for all to see. 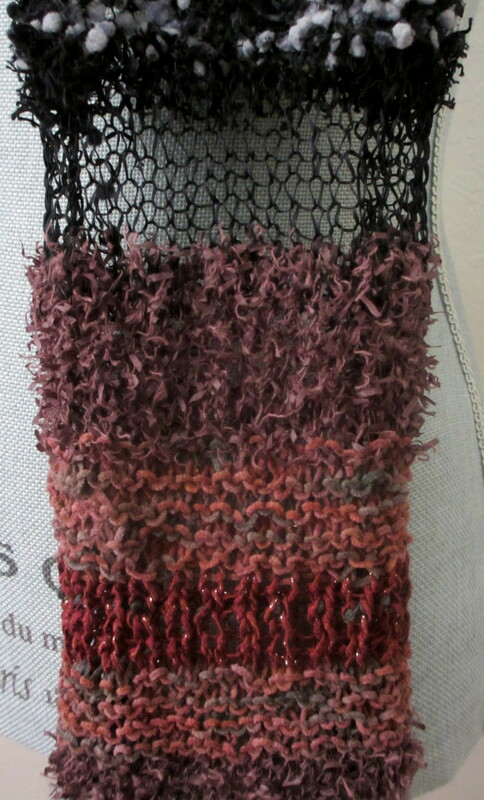 A sampler of textures expressed in the following images were knitted using Alchemy Yarns, and Habu (top left) and Habu and SMC Select (bottom two images). Using a size 10 US (6mm) needle, the stitches in the pieces were stockinette stitch, garter stitch, K1, P1 rib, K2, P1 rib, (RS) K1, P1 and purl back on the WS, seed stitch and Polperro Laughing Boy stitch. 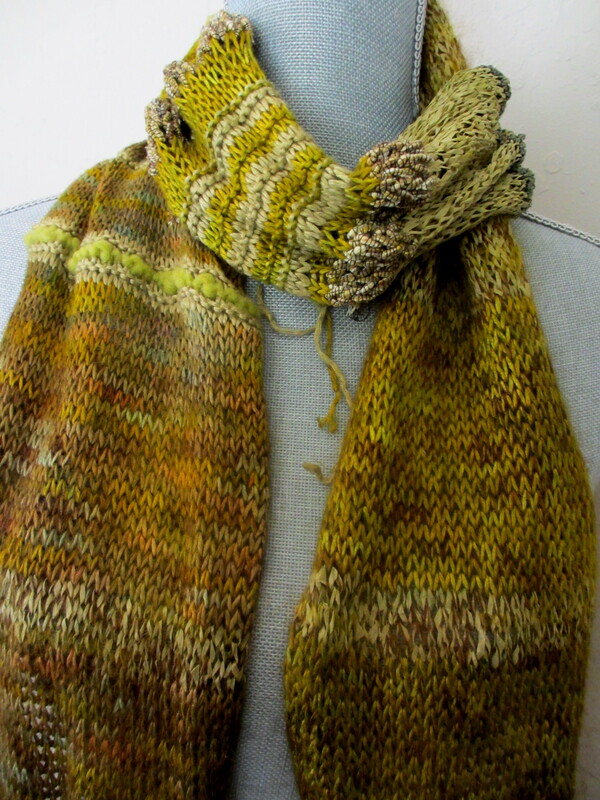 Kits for the scarf pictured below are available from lena@veryknitshop.com. I’ve finished adding a crocheted edge to Neck Candy. Knitting and crochet are perfect pairs in the world of stitches. 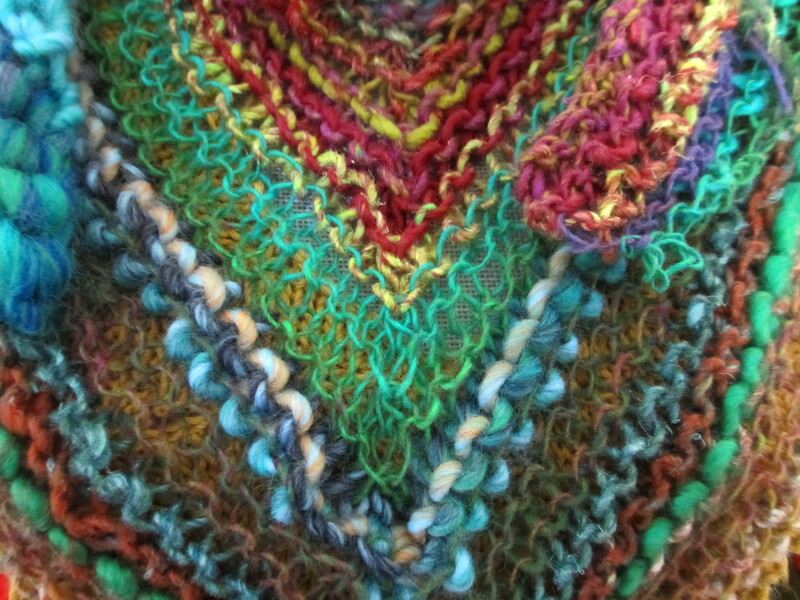 The edge was crocheted using Noro’s Taiyo Sock Yarn. The ruffling effect added an interesting dimensionality. The edge frames and supports the knitted stitches which balances the appearance resulting in a finished look. 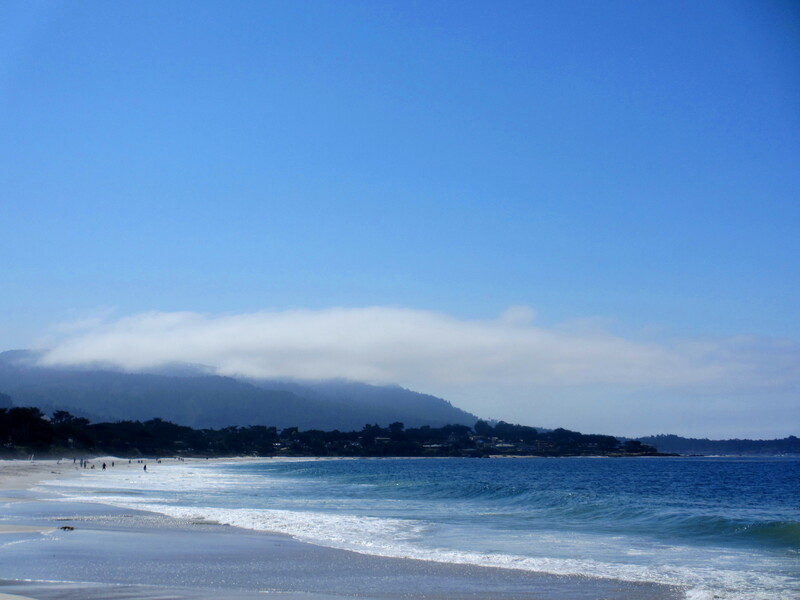 This year, for my husband’s birthday, I planned a getaway to Carmel, CA where I took pictures . We enjoyed the beautiful landscape walking along the edge of crashing waves watching the shore birds, while we looked for beach treasures. As the sun was beginning to set, it was time to get ready for dinner at our favorite restaurant in Carmel. 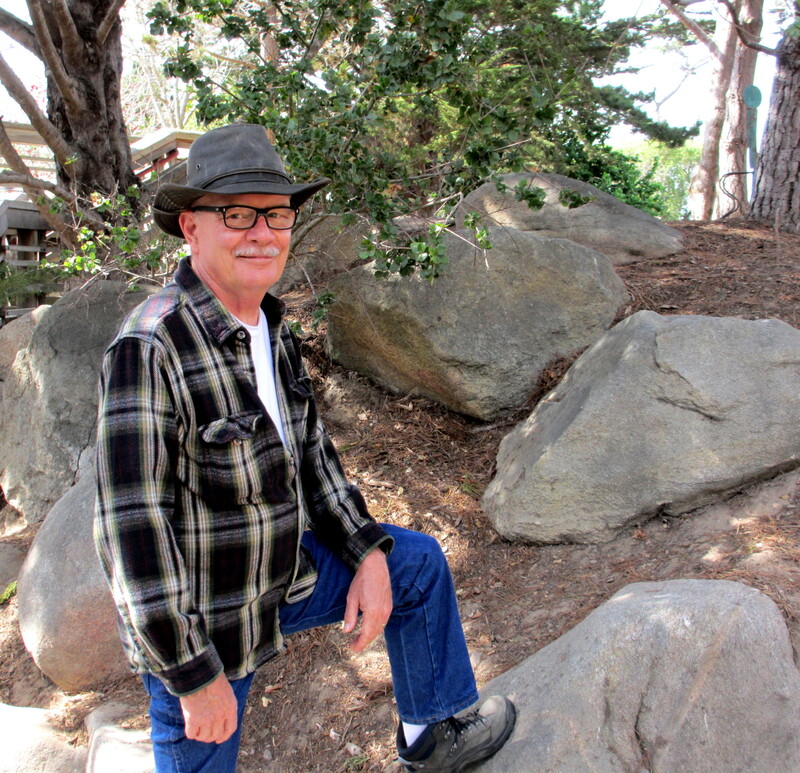 A trip to Carmel would not be complete without a visit to Knitting By The Sea. 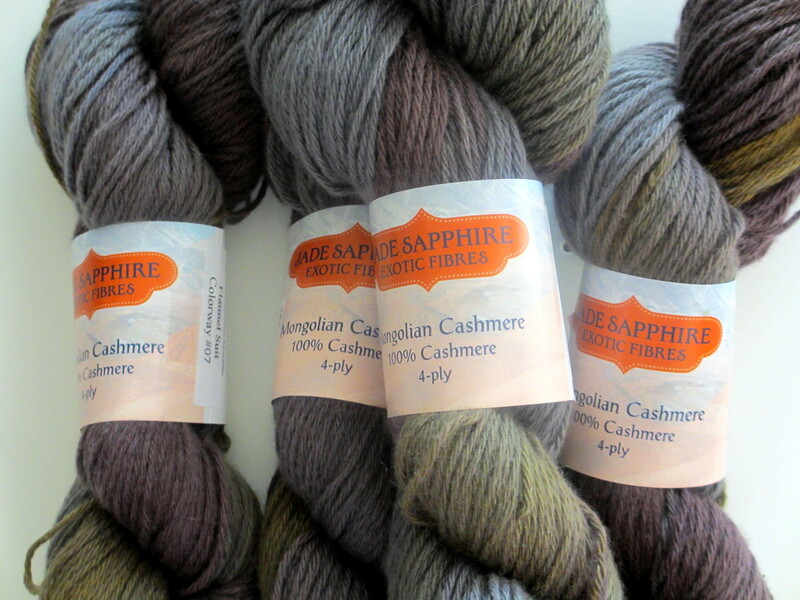 Pleasantly, I found four hanks of Mongolian Cashmere. 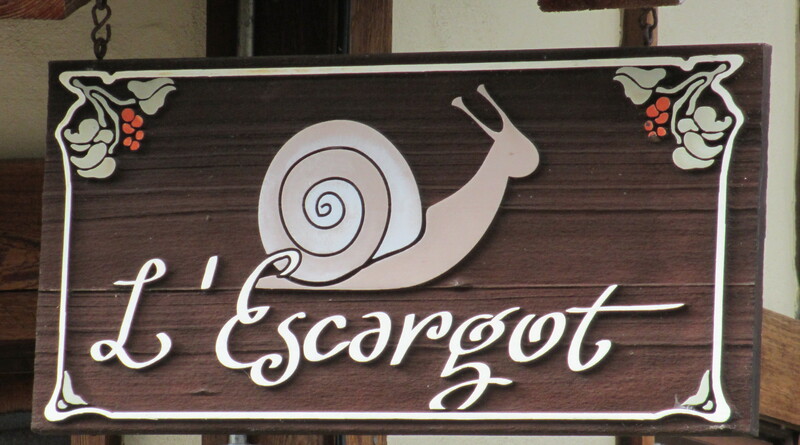 We had a wonderful time and look forward to our trip next year to celebrate my husband’s birthday in Prague. 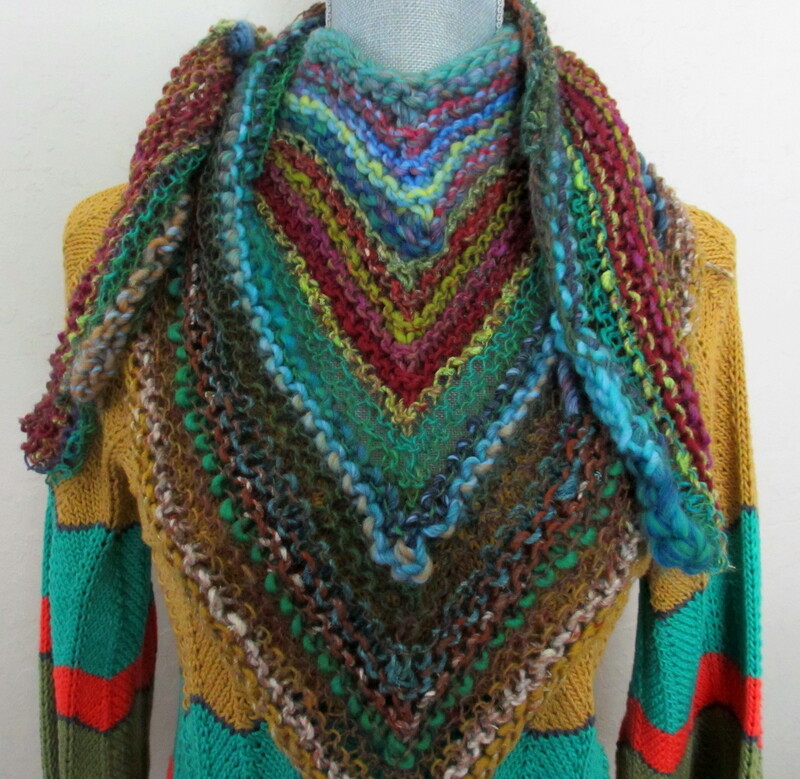 What happens when you design a pattern and use two different types of yarn, which can be worn three different ways? 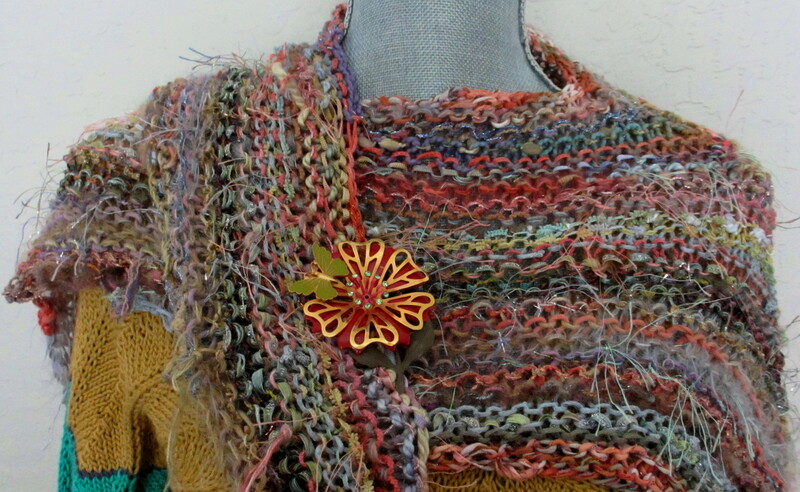 The neck adornment shown on the left displays two different gauges of Noro yarn consisting of silk, wool and a small amount of nylon. 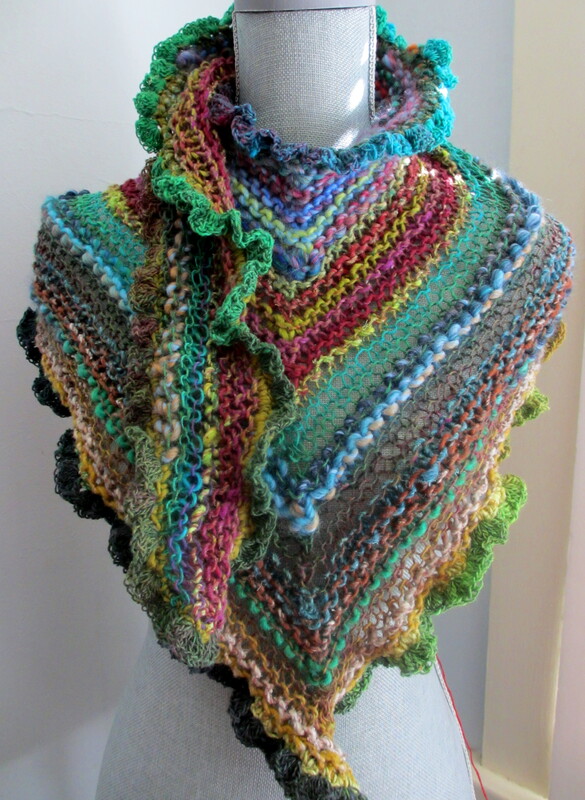 I decided to use a heavier gauge yarn from Katia because it coordinates well with the color and texture of the Noro yarn. The lower image shows Cool Stuff by Prism Yarn. Prism Yarn known for its “glitz and glam” creates an ornate and opulent appearance by adding glitzy, novelty and textured yarns all in one hank of color. 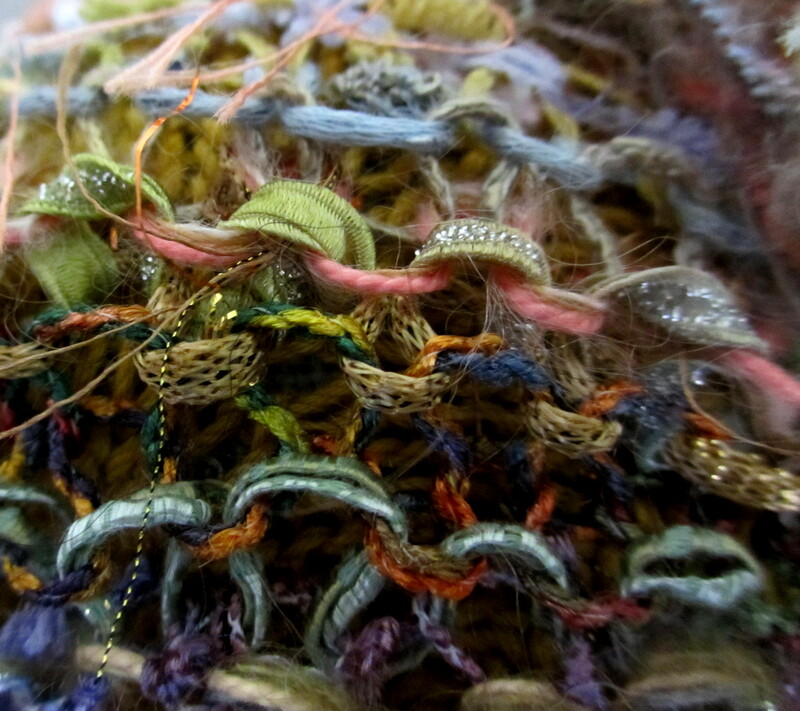 Each yarn is tied together forming one continuous yarn of surprises. 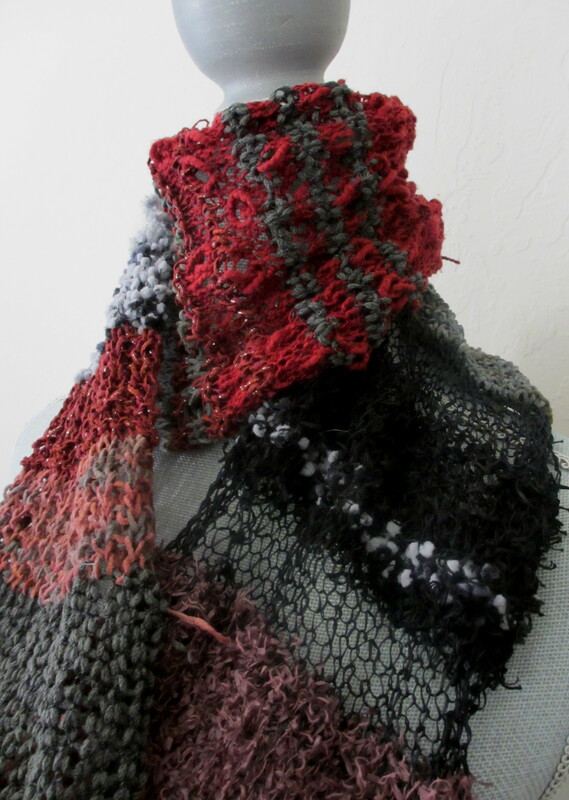 I mixed Cool Stuff with a variety of other glitzy yarns, and marvel at the luxurious combination of sparkle and texture. Both neck adornments were knit using garter stitch. I plan on adding a crocheted edge to both. Neck Candy may also be worn as a shawl. 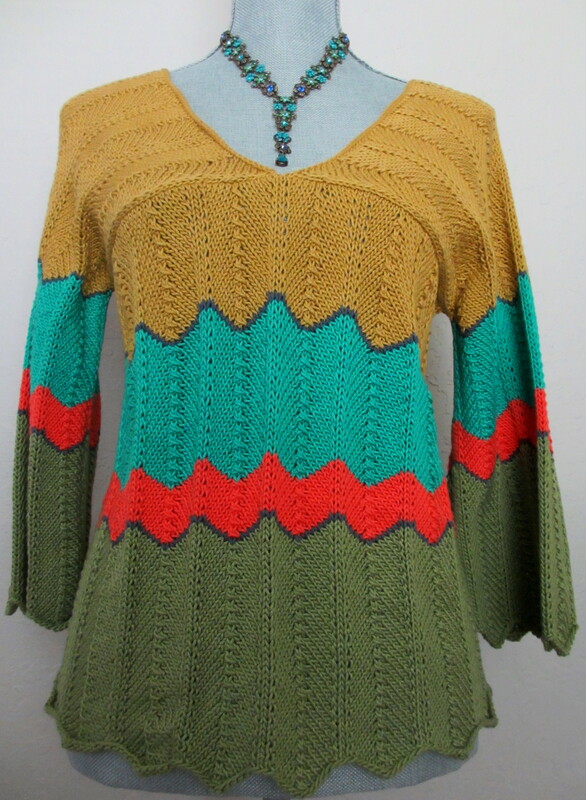 The chevron sweater is finished! The directions are pretty straight forward with a twist when attaching the sleeves to the yoke. I truly enjoyed knitting this sweater, and look forward to wearing it with my favorite pair of jeans.